The iPhone needs more mini golf games. That is what I said to myself recently. Then I found out about Mini Golf Mundo. This game is awesome. Up to four family members can enjoy eighteen holes of golf. Technically eighteen holes of golf times the four golf courses. The courses get progressively more difficult in Mini Golf Mundo. They start so easy that you will be getting hole in one after hole in one. Then you may struggle a little bit. Finally you will use up every shot on a hole and the game will graciously move you on to the next hole. There is a lot of mini golf in Mini Golf Mundo for $1.99. No in app purchases. One, two, three or four players can enjoy a game of Mini Golf Mundo. Direction, and power are important in Mini Golf Mundo. Expect to play around with it trying to find the right combination. Mini Golf Mundo looks nice for an iPhone game. 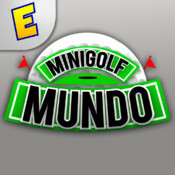 Mini Golf Mundo would work great on the Nintendo 3DS and Playstation Vita. I hope to see this game ported in the near future. I would also like to see a sequel to Mini Golf Mundo on the iPhone. There are so many different things that could be explored with the ideas in this app. Mini Golf Mundo has some wild mini golf course. Players use bouncy pads to get to the right location. There are also pieces of the course that will vanish and come back. Those can be crazy difficult to figure out. Windmills, fish, hills, water, and more. Mini Golf Mundo is a top notch video games that families can enjoy for months.